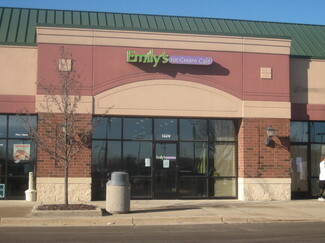 Posted on Mon, Jan 23, 2012 : 5:58 a.m.
Ice cream lovers soon will have another option when Emily's Ice Cream Cafe opens in late February in the former Cold Stone Creamery space at 1329 E. Michigan in Saline in the Sauk Trail Commons shopping center, which is anchored by Country Market. Owners Herman and Christine Marquardt also own Sarah’s Bridal in Milan, named after their older daughter, Sarah, 7. They decided to open an ice cream shop named after their younger daughter Emily, 6, who is “an ice cream nut,” said Herman. In addition to ice cream, the shop will serve frozen custard and a version of "mix it" ice cream in the style of Cold Stone. It will also sell ice cream cakes and specialty cakes made on site. 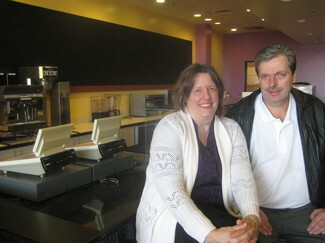 Herman and Christine Marquardt, owners of a Milan bridal shop, are opening Emily's Ice Cream Cafe in Saline. Emily's Ice Cream Cafe in Saline is expected to open in late February in the shopping center anchored by the Country Market grocery store. To encourage people to linger, the 24-seat store will offer coffee and other beverages. The owners are considering adding sandwiches to the menu in the busier summer months. Four to five people will be hired to start, including a manager to run the day-to-day operation. They anticipate hiring more workers in the busier months. Since the 1,900-square-foot-space was already set up to serve as an ice cream shop, the Marquardts only needed to bring in new equipment and make some cosmetic changes, such as repainting the walls. Daughter Emily picked the colors: soft purple, green and yellow. Although the Cold Stone Creamery in that location went out of business, the Marquardts believe that is more a result of the challenges facing that particular franchise. The couple also welcomes the proximity of nearby ice cream shops such as Dairy Queen and Mickey’s Dairy Twist. “Our feeling is the more there is, the more it draws in,” said Herman, who added that Emily’s will be open year round. The Marquardts are in growth mode, with several entrepreneurial efforts in the works. Previously automotive part manufacturers in Milan, they had to shut down that business two years ago due to industry slowdown. Turning to new ventures, the couple opened the bridal shop a year ago, which has done very well. Located at 525 S. Redman across from Milan High School, the owners are already considering expanding the store from 7,500 to 13,000 square feet. They are also planning to open a second ice cream store called Emily’s 2 in the 82,000-square-foot building they own, which houses the bridal shop. They are considering opening a restaurant in the same building, although they would prefer to lease out the space to a tenant for that purpose. Thu, Jan 26, 2012 : 1:40 p.m.
Congratulations! It's nice to see a chain store being replaced by a locally-owned store instead of the other way around for a change. If you really do want to encourage patrons to 'linger', consider having WiFi too. Wed, Jan 25, 2012 : 4:07 a.m. Thank you so much for the encouragement everyone. Just to answer an above question, we will be using as many made in Michigan products as we possible can. The custard and mix in ice creams will all be made in house with our own special recipes with the highest quality ingredients from Michigan creameries. As for the hand dip ice cream, spumoni, and italian ice there is a tiny micro creamery and confectionary on the east side of Detroit called Alinosi, believe me there is no better. Google them or ask any old school eastsider who has the best ice cream and hands down its Alinosi. They also make all the topings, chocolates and such in their little plant on East McNichols since 1921. I was so excited when they agreed to allow us to sell their ice cream at our little store. Hope to see everyone at the grand opening! Mon, Jan 23, 2012 : 8:51 p.m.
Great idea investing locally..... say.... maybe they can open a laundry or dry cleaners in case someone spills ice cream on their wedding dress. Thank you to the Marquardt family for reinvesting local money into another local business. I, for one, am glad to see that it isn't another national chain restaurant going in. The article states that the cakes will be made on site; what about the ice cream/custard? Hopefully, it will be produced on site (if that's even an option) or sourced locally as well. Congrats and good luck! Mon, Jan 23, 2012 : 5:18 p.m.
Good luck. Sounds like a good competitive edge to me. Both sisters get their own business and at 18 can own and operate it. Interesting. Mon, Jan 23, 2012 : 2:36 p.m.
Should've been a Culvers, but good luck anyway.